Start collecting reward points immediately! Simply apply online at www.salonrewards.ca, and your card will be mailed to you within 10 business days or visit one of 20 Salon Rewards locations and apply in salon to receive your card right away! Earn points for SALON REWARDS ™ participating purchases. You’ll collect 10 SALON REWARDS ™ Points for every dollar spent on professional service and product purchases at a SALON REWARDS ™ participating location*. Tracking your rewards balance is easy! Checking your point balance is easy! You can check your balance online at www.salonrewards.ca. Choose CHECK BALANCE from the menu located across the top of the screen, then select Create Online Password, enter the card password: 1234 and then create your own unique password. Once completed, you can log in using your card number and unique password to check your points balance as often as you like! You can also check your receipt each time you make a purchase for your current point balance. Share your card among your family members! Our wide variety of participating locations satisfy the hair care and skin care needs of every member of your family! 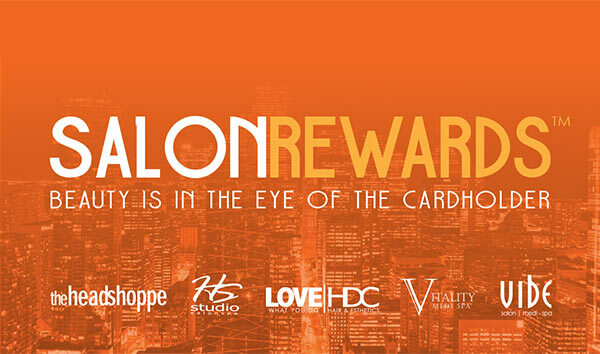 You can collect and redeem points at any of our four participating SALON REWARDS ™ brands. For more information on our participating brands, visit www.salonrewards.ca. Earning points is easy, and redeeming them for rewards is even easier! Each time you make a purchase, your current points balance will appear on your receipt. Check the rewards chart below to see how much you are eligible to redeem!